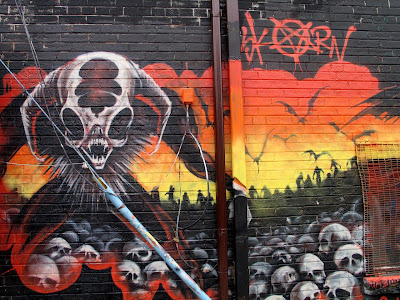 [introductory note: Graffiti Alley is a Graffiti Mecca in Toronto. 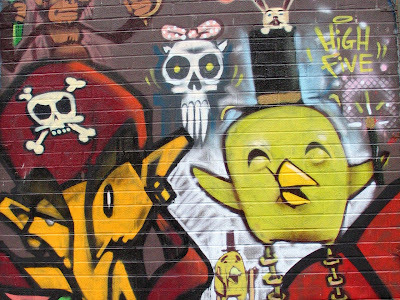 Toronto's Graffiti alley is a lane that runs just south of Queen Street West, entering east off of Spadina. Some people will convince you that this alley ends at Portland, where you are forced onto Richmond. 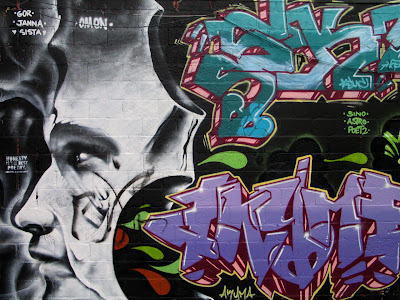 However, if you explore both east and west of Graffiti Alley, what is labeled Rush Lane on Google Maps, you will find much more street art lurking around. The alleys that run north and south from these lane ways also make for excellent galleries. Local art that showcases one of the prominent city landmarks. And now? Now you are on a photo blog, so all is well. To be honest, there's really no such thing as an ugly cartoon penguin. Timmie's cup? Snow? Toilet outside. Yes - you're in Toronto. I like to think of this as a statement on our city. It's 1994 again, and I need to defeat the cyber-demon? Without a doubt, this is one of my favourite pieces currently showing. 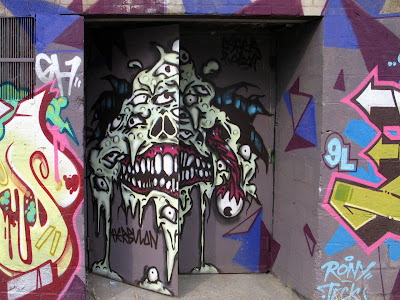 Macabre door-coverings part their way. Chickens, and bunnies, and pirates. Oh my. 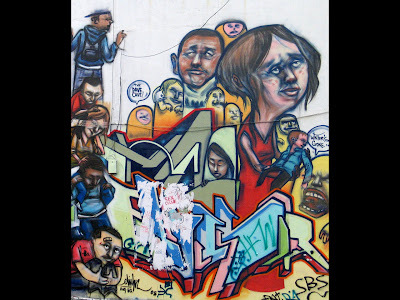 The group dynamics - spontaneous murals - is showcased here. 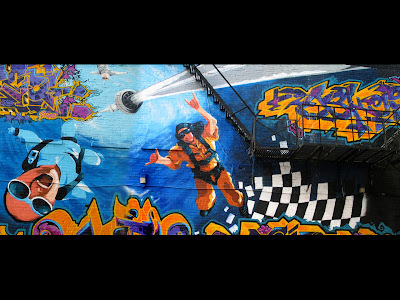 I love going to graffiti alley. Contrary to what some visitors might think--it is not a gangland nor a place riddled with violence. This is Toronto! I take my little one there with me! :) I just love that toilet seat and timmy's cup image--it's sort of like an "accidental art", which is what i love. Wow, I'd like to see this in person some day. 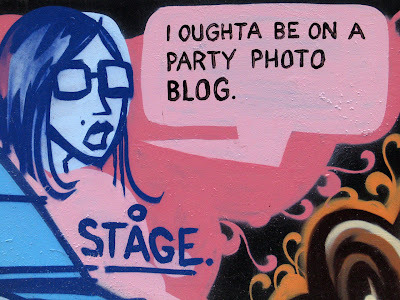 Thanks for the introduction to the Graffiti Alley. and you should. There's so much fantastic beauty here. 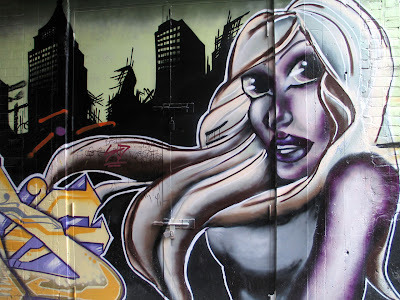 There really are few things I love as much as graffiti, for reasons I posted in the last entry. It's easy to find, and a great spot to visit. I'd really like to track down these sites around the world - but you need someone to show you the way, more often than now. wow. i'm a big fan of graffiti. not tagging so much, but "street art." 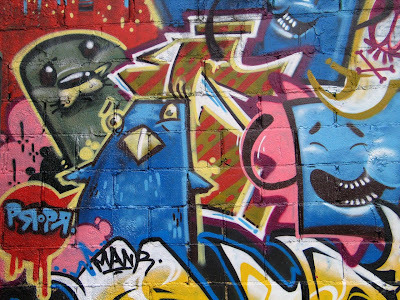 Tell me where these graffiti criminals live so I can do something they don't like to their property.P>S> Graffiti and art are two words that don't belong together !! !